Baywatch had Baywatch Nights, Hollyoaks had Hollyoaks Later, and now for a limited time only, The Modern Pantry has The Modern Pantry at Meza. All of these reincarnations come across as racier, edgier versions of the original. 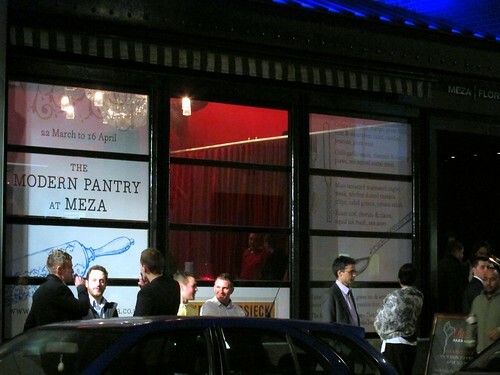 However there seems to be one key difference between Anna Hansen’s creation and these cheap TV spinoffs: The Modern Pantry at Meza isn’t crap! Meza is a hustling, bustling, buzzy bar in the heart of Soho and it was heaving on a Friday night with patrons clamouring for cocktails. Can’t decide between a quiet meal, or a cocktail bar on a Friday night? 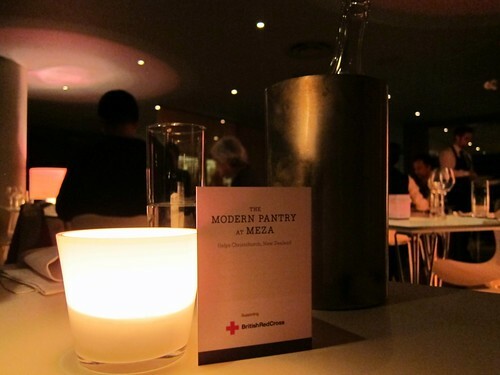 The Modern Pantry at Meza provides the best of both worlds. 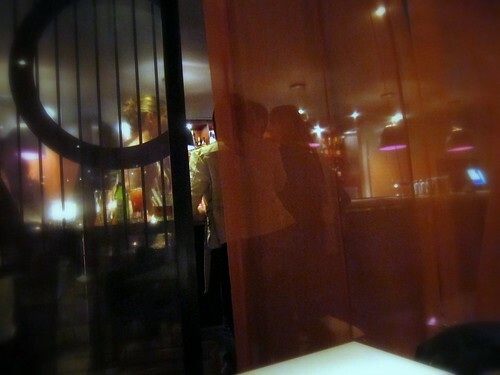 The restaurant was separated from the bar area with only a thin, sheer curtain, which was enough to provide some privacy yet still make us feel like we were part of the action. Dinner served to the nearby sounds of pumping music, chattering and occasional glasses shattering were regular reminders of this. Nice to see they were supporting the Britsh Red Cross in raising money to help Christchurch. I was excited to be dining here. So excited in fact that I made sure I only had a small soup for lunch… practically unheard of for me on a Friday! As I browsed through the menu I had trouble deciding what I wanted to eat, as I wanted everything! In the end, we decided that the best option would be to share a number of small plates. In terms of the food I felt that dishes fell into two categories: dishes I found immensely tasty, and dishes I found fascinating to eat to an almost re-educational degree. I would say the aubergine dish fell into the latter category. 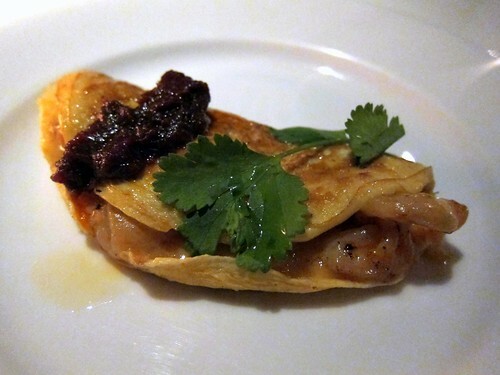 The sauce and crispy shallot topping was very similar to what I’d typically find in a Chinese steamed fish dish. Instead of the fish there was a very smoky, grilled aubergine, very similar in taste to a smoky baba ganoush we purchased once from a Lebanese supermarket on Edgeware Road. We weren’t fans of the smoky aubergine, just as we weren’t fans of the similar tasting baba ganoush. But it did make me think what a great substitute a less smoky aubergine would be for this typical Chinese fish dish. I instantly fell in love with the venison dish. I’ve never had such tender and delicious venison before. The carrot, ginger and miso gratin was also very tasty. I was slightly concerned the ginger would overwhelm, but it was so subtle that it was barely detectable. 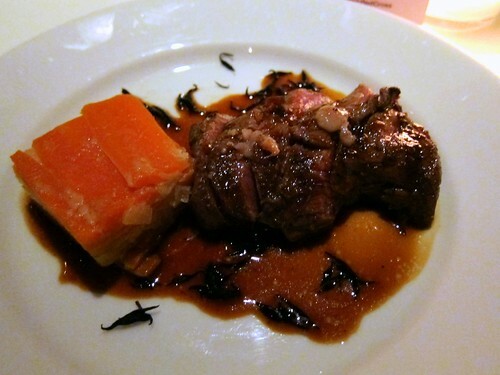 The jus, richened with bone marrow was lovely and meaty and the hijiki made an interesting and worthy addition. After our prawn omelette at The Modern Pantry for brunch failed to impress, we took a bit of a gamble and gave it another shot… it paid off. This was a massive improvement and almost a completely different dish. Creamy on the inside with plenty of flavoursome, spicy sambal to kick things off. It was just fabulous. 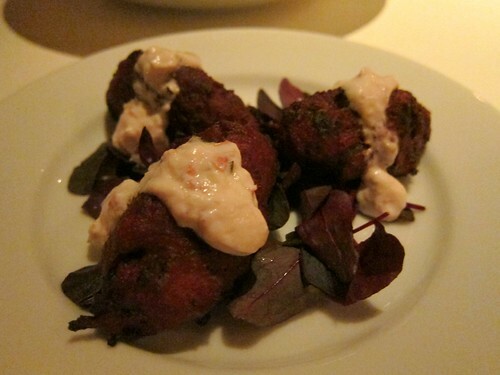 My dining partner likened the beetroot fritters to a savoury dessert. The texture was dense, with the occasional pop as you bit into a piece of okra. Currants provided subtle sweetness as did the rose flavouring in the yoghurt. 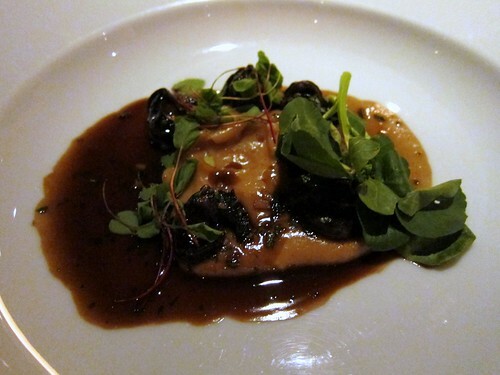 The snails was another dish that fell into the “fascinating” category. The slightly sweet chestnut puree was thick and gooey and tasted not unlike a Chinese dessert. Snails were meaty, and we could taste the garlic and chilli though there was very little heat to it. I found it difficult to get my head around this dish and am still undecided about it, as it was so different to anything I’d ever eaten before. The ham hock salad was a definite favourite. 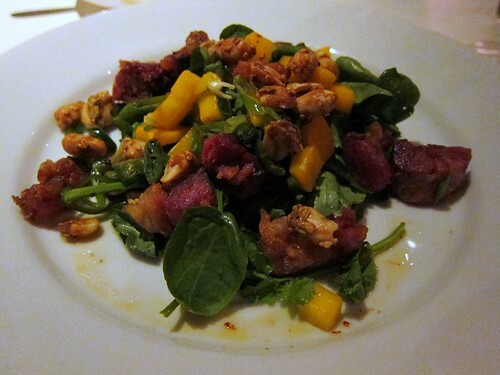 Full of bright, gorgeous tropical colours, this Asian influenced salad had a beautiful balance of sweet mango, and candied peanuts with crispy, salty ham hock and a little kick of chilli. Seriously yum, and brilliantly obvious so it begs the question, why didn’t anyone think of this before?! 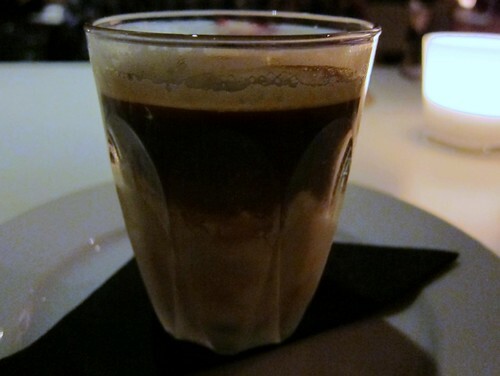 The cinder toffee affogato was lovely and made with fantastic coffee from the Caravan Roastery. 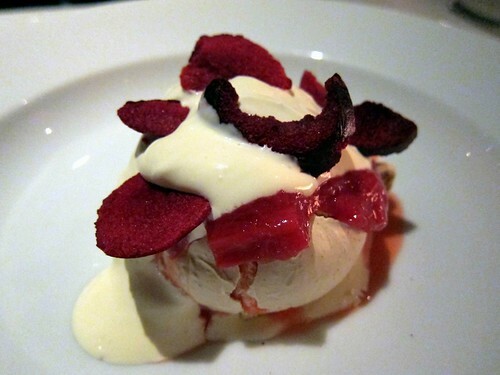 I adored the ice cream with it’s large chunks of crunchy, honeycomb textured toffee. It was formally known as Hokey Pokey Ice Cream, but due to a legal issue they were forced to change their name. I’m not sure if the recipe changed along with the name, but I thought the new name suited it better as Hokey Pokey Ice Cream is well known in New Zealand and implies a differently textured toffee. It’s been years since I’ve tasted a fresh feijoa (which are gorgeous and hugely popular in New Zealand), so I was a bit disappointed I couldn’t detect any feijoa in the meringue at all. Instead it came across as very lemony. But the balance between sweet and tart was excellent. Also the dehydrated plum crisps made a nice addition. My dining partner’s pronunciation of the word “feijoa” as “fei hoa” brought me great amusement. Although it’s probably technically correct, I’ve only ever heard New Zealanders pronounce it “fei joa” which was also echoed by our waiter. 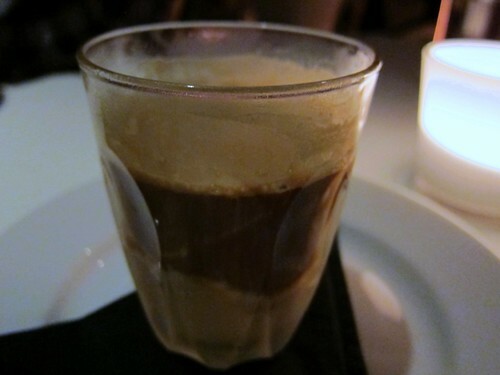 I thought it wise to order a decaf affogato as I tend to have trouble sleeping when I have coffee at night. We’d almost finished it when a waitress suddenly dove in and grabbed it from us, apologising profusly for accidentally serving us a caffeinated affogato. It wasn’t a huge deal to me as it was a Friday night after all, so the waitress’s concern was slightly amusing. We were also secretly pleased as it meant we could have another whole affogato, because it was delicious! The decaf was still good but I did miss the buzz of the cafeinated affogato. If only affogatos could be served for breakfast, the world would be a better place. We were really chuffed when we found out at the end of the meal that Anna Hansen herself had been cooking. Her innovative, fusion style is so impressive and shows a high degree of talent and knowledge about combining and balancing different cuisines and flavours. 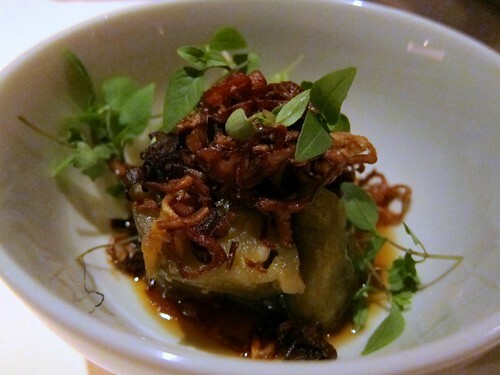 Our meal at The Modern Pantry at Meza was wonderful, and they’d successfully brought their special brand of innovative fusion to a whole new environment without sacrificing any of their quality or values. Our dinner for two, with a carafe of New Zealand Sauvignon Blanc came to about £42 each which I felt was definitely well worth it, considering how much we’d enjoyed our meal. Anna and Co. will only be there until the 16th April, so I’d highly recommend you make a booking soon before they’re gone! I love the Baywatch simile at the start! I had the omelette when I went to the Modern Pantry and really loved it, but I think Anna was in the kitchen that night. Is that old chestnut about consistency when the chef’s away I guess. I would agree on the consistency thing. Bit of a shame really as it’s such a fabulous dish when it’s done right! Alas I can’t take full credit for the Baywatch simile… my dining partner mentioned it during our meal and I thought “hmmm… I shall have to steal that!” Got permission first though.